Comments On Humerus bone "2 "
This photo doesn't say which arm this humerus bone comes from. I'm sure I can figure it out, just have to go somewhere else for that info. 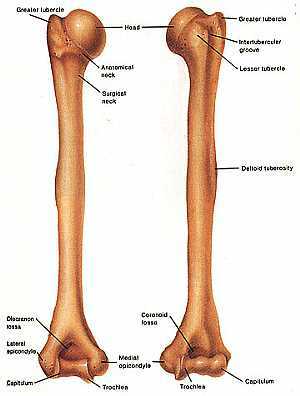 --------------------------------------------------------------------------------- You need Three directions on any bone to know its side in humerus for example: 1. the head is medial./ Greater tuberosity lateral. 2. the head / greater tuberosity is superior. 3. the olecranon fossa is posterior./ coronoid fossa is anterior.